Vatican City - (Agenzia Fides) - "Africa is losing some of its most gifted young people to migration because of the exploitation of natural resources and the environment ", said His Eminence Cardinal Wilfrid Fox Napier, Archbishop of Durban (South Africa), during a meeting with the press on the margin of the XV Ordinary General Assembly of the Synod of Bishops on "Young People, the Faith and Vocational Discernment". Referring to the work of the Synod, the Cardinal appreciated that not only "we talking about young people, but we are talking with them and to them" and praised the contributions of 34 young people invited by Pope Francis to be active participants in a meeting predominantly comprised of bishops. 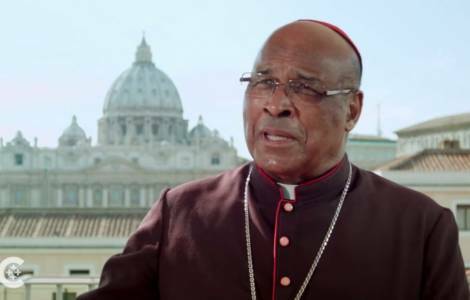 However, Cardinal Napier complained that the Synod's working document was excessively "Eurocentric", emphasizing that the synod’s work must take into account the situation of young people and the Church in other parts of the world, noting especially the needs of the Church in Africa. The African delegates to the meeting - said Cardinal Napier - "should present the African reality much more clearly from our perspective". According to the Cardinal, one of the central issues to be addressed is that of migration. However, he noted that the document does not sufficiently recognize the impact of mass migration from Africa on the continent’s countries. "Africa is losing some of its most gifted young people to migration, he said, because of the exploitation of natural resources and the environment". "Those who would have been living off the land are now unable to do so", the Cardinal recalled, "so they migrate because of the effect of deforestation and aggressive mining techniques". He also decried the economic conditions that lead to child labor in Africa, saying that because children are put to work at a young age, they "are not getting the education they need in order to have a good start at life". Finally, the Cardinal said there is another African reality that is not reflected in the synod’s working document. "While many young people in the West are leaving Jesus, or at least his Church, and they are doing this for a variety of reasons... in Africa there is a very different kind of phenomenon and that is that young people are looking for Jesus and looking for answers to their problems in the Church".